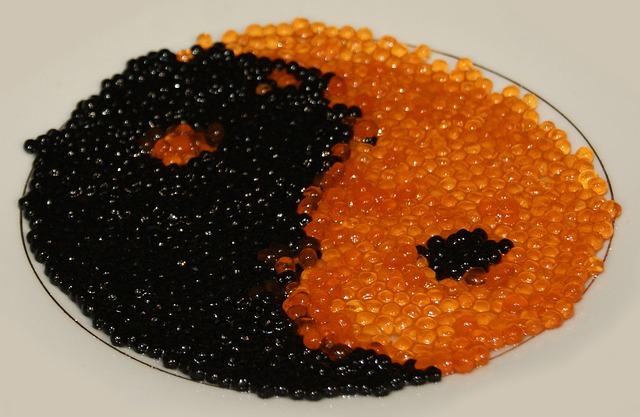 Roe and caviar are similar because they both are fish eggs. However, in a comprehensive explanation of both, they tend to differ. Roe is fish eggs or male fish sperm and is in an ovarian membrane. Caviar, on the other hand, is roe which has been salted and then placed in tins for aging or storage. So, caviar is fish roe that has been processed of particular types of fish especially sturgeon. It is considered as a delicacy in many parts of the world. Roe is also a delicacy, and it is considered as seafood. In fact, it is healthy as well, therefore, a good source of omega three fatty acids. In some menus, the two delicacies may be confusing, but this article enumerates the distinct differences between roe and caviar. The differences will help you to determine which food choice will meet your budget, preference and culinary needs. Roe is considered as the general term that refers to eggs in the ovary of a fish. It can be eaten raw, or it can be cooked as an ingredient in any seafood recipe. The eggs could be from marine animals like shrimp, scallop, and sea urchins among others. The delicacy has health benefits because it is a good source of omega three fatty acids and vitamin B12. However, they should be eaten in moderation because they are rich in sodium and cholesterol. These are good nutrients, but in high quantities, they could be harmful to the body and cause diseases. Cavier is a delicacy that includes salt-cured roe mostly from the fish known as sturgeon. What happens is that the eggs of the fish are harvested from their ovaries and then passed through a meshed strainer. After this, their liquids and fats are drained from them, and then they are salted and cured in a container. The main purpose of curing the eggs is to make them firm up. True caviar comes from only one of the sturgeon breeds that exist in the Caspian Sea. The people who make caviar must undergo an apprenticeship that lasts between 10-15 years. Caviar should be served with silver utensils because metal affects the flavor significantly. It should not be frozen because it will end up mushy. It is recommended for doctors by doctors for men who are impotent. 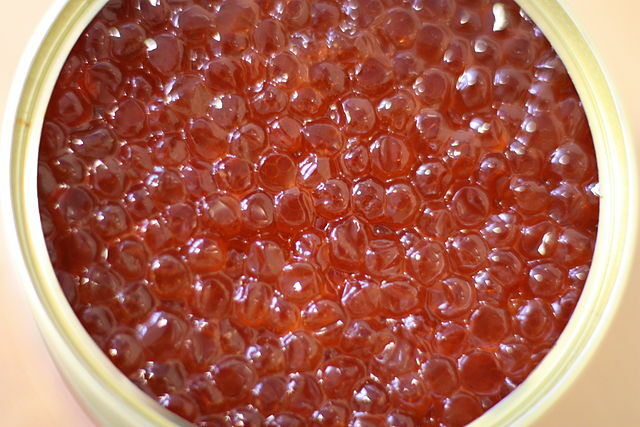 Fish roe is fish eggs or male fish sperm. Cavier, on the other hand, is roe that has been salted and then stored in tins for aging. However, cavier is mostly from sturgeon. In other words, roe is a general term for harvested eggs of marine animals while cavier is salted roe. Caviar is black or silver in color. However, the finest caviar is lighter in color. Fish roe, on the other hand, appear to be orange in color. They have a bright color, and one can tell the two apart from the differences in their colors. Fish roe is affordable in most restaurants. The prices vary, but they are not high. On the other hand, caviar is considered as an exquisite meal therefore it is quite pricey in most restaurants that offer the delicacy. Fish roe can be obtained from any marine animal like sea urchins. Caviar, on the other hand, is considered caviar only when the eggs are salted and cured of sturgeons. Most people don’t consider salted eggs from other marine creatures as cavier. Fish roe has a high-fat content therefore it is highly perishable. It is not advisable to store it in the refrigerator for long. In fact, it should be eaten on the same day it’s thawed. Caviar, on the other hand, has a decent shelf life because it is salted. It can, therefore, stay in the refrigerator for up to a month after it has been opened. Fish roe has a soft and squishy texture. The texture of caviar differs from the texture of fish roe in that they have a firm texture that transforms into a smooth texture as melts in the mouth. Only low-quality caviar can have a soft and mushy texture. In some restaurants, the two delicacies may come off as one item, but they are different. While fish roe is fish eggs, cavier is more than that. It is salted fish eggs that are cured and stored. Both are considered an excellent delicacy hence their exuberant prices as compared to fish roe. Roe can be obtained from any marine life, while caviar for some people is only caviar if obtained from the wild sturgeon in the black or Caspian Sea. Cavier and fish roe also tend to differ in their appearance and texture. Cavier appears to be dark and silver while fish roe has a bright appearance orange in color. These foods are common in the Japanese culture, and sometimes, they are served with sushi. It is difficult not to love both cavier and roe because they have great nutritional value. In fact, they are a great source of omega three fatty acids. Fish roe is enclosed in an ovarian membrane, and it can be cooked wholly in salty water and eaten with bread. Cavier can be deep fried or boiled. Try out both foods to avoid missing out on the greatness they offer. Evah Kungu. "Difference Between Roe and Caviar." DifferenceBetween.net. 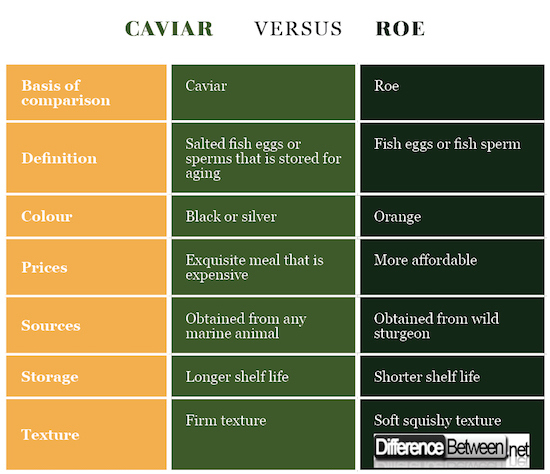 May 15, 2018 < http://www.differencebetween.net/object/comparisons-of-food-items/difference-between-roe-and-caviar/ >. Your “Comparison Chart” contradicts the text. “…Roe can be obtained from any marine animal….”. Goldstein, D. (1999). A Taste of Russia: A Cookbook of Russian Hospitality. Russian Life Books. Retrieved May 28, 2017. Linda Stradley. "Culinary Dictionary - C, Food Dictionary, Whats Cooking America".